Part 3: Briefs or Boxers? Before sinking serious time and money into the project that I really didn't have anyway, I wanted a pretty good idea of how it would look "in the flesh". I also wanted to be sure that whatever changes I made actually resulted in a better bike and not in a dangerous bodge. That's what makes this sort of project so interesting to me. I'm an engineer, so doing thing methodically comes easy, but I like to exercise the right (creative) side of my brain too. When I looked at the frame it was obviously very heavy and not very stiff. Around the steering head two pairs of tubes cross over, but Suzuki had decided to keep the bike narrow and had squeezed the tubes in, making the front end prone to flex and twist. They then clad that abomination of a design, in sheets of thick heavy steel which contributed little to stiffness, but added a chunk of weight. The frame shape is the classic Norton Featherbed style lozenge which is great for a 50 HP single, but not very good for a heavy, powerful (yeah right) bike like a GT750. Getting the weight off looked to be simple enough - just a lot of work. For example, Suzuki used 4 heavy duty points to locate the radiator where modern bikes would use 2 or 3 very light ones. It's easy to forget that back in 1972, Suzuki were breaking new ground with a water cooled bike in volume production, and they didn't want it to be fragile. Motor mounts followed conventional British lug design, but updated from brazing to welded. Incredibly heavy cast lugs were welded to the frame tubes. 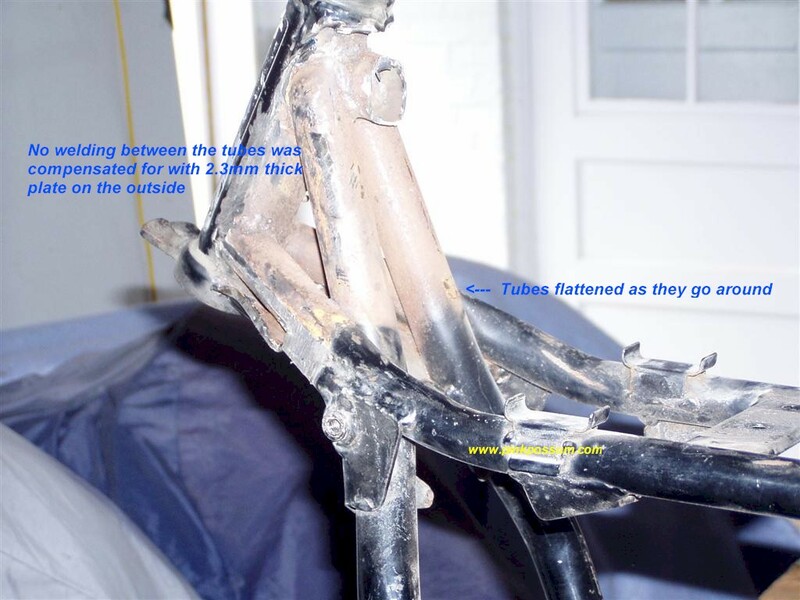 They are actually well designed and were welded along the center line of the frame tubes. Good engineering design, but so heavy. I started to play with shapes and possible frame configurations to make the thing stiffer and lighter. At first I used a simple graphics manipulation tool and came up with all sorts of interesting frame shapes. My 3D modelling skills are non-existant, so the next step was to take a bare frame and "draw" on the new tubes. The simplest technique is to use rolls of masking tape. It's cheap and easy to use and easy to change. It's also easy to see if it will actually work in the real world. After a roll or two of tape, the shape was starting to appear and so were the solutions to some of the frame design problems. Of course, anyone with a regular brain would have realized that most of this mental exercise was not necessary. Wider rims on stock hubs with a pair of CBR600F2 calipers on CBR600F4 disks, using a stock frame and swingarm, would have been perfectly adequate for the purpose - and probably a whole lot cheaper. The decision had been made early on, that the look had to be simple and relatively stock - translation: stock tank and side covers over cleaned up frame. When the seat arrived, the look started to gel and design decisions were starting to be set.